I just checked the date, and realized it was September 11, a day we will always remember. The date may have more significance to me than to others. I had my cytoreduction surgery in New York City on May 16, 2001. I was scheduled for three month follow-up appointments on September 5-6, 2001. My oncologist in New York called me near the first of September and said she would be unavailable for my Sept. 5th appointment, could I please reschedule the visit for September 11th. At the time I told her I had already booked a flight, made childcare arrangements, and reserved a hotel room, so I would be unable to change my appointment. September 11th was also my scheduled chemo day, and I didn’t want to miss or reschedule a chemo treatment. She reluctantly agreed that this one time only she and I could instead have phone conference. I went to my appointments on September 5th. As we were staying overnight in New York we had some extra time between appointments. During previous visits we had used the extra time to explore New York City. On our first visit we had explored the Upper East Side. My second visit we explored mid-town; saw Times Square, the New York City Ballet, and Carnagie Hall. The third visit in September we explored lower Manhatten. 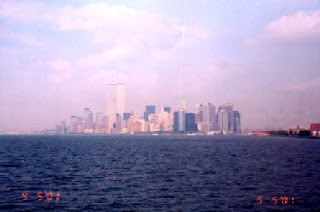 I took pictures of the Twin Towers from the Stattan Island ferry. I had the pictures developed on the 10th. The night of the 10th I showed my kids pictures of the Twin Towers on the New York City skyline. The very next day, the planes hit the towers and they ceased to exist. When I went for my chemo appointment on September 11th, all eyes in the office were glued to the TV sets and the news broadcasts of the terrorist attacks. On the news I saw people running down streets I had walked on just days before. I’d sat on a lawn near the Twin Towers just days before eating a picnic lunch. I wondered how many of the people I’d seen that day worked in the Twin Towers and had lost their lives. I thought of what it would have been like if I’d changed my appointment to that day. Would we have been sitting next to the Twin Towers when the planes hit? I’d been to New York with a cancer diagnosis I wasn’t expected to survive, but others, I’m sure many who were very healthy, perished in the Towers just days after I’d sat on the lawn wondering if I’d live much longer. It seemed so ironic. In my mind a phrase echoed for weeks…none of us is promised tomorrow. Maybe a thin silver lining to a cancer diagnosis is that we don’t assume tomorrow anymore. We live with the fear of our days very possibly being limited. We no longer take our tomorrows for granted, we know they are not promised.